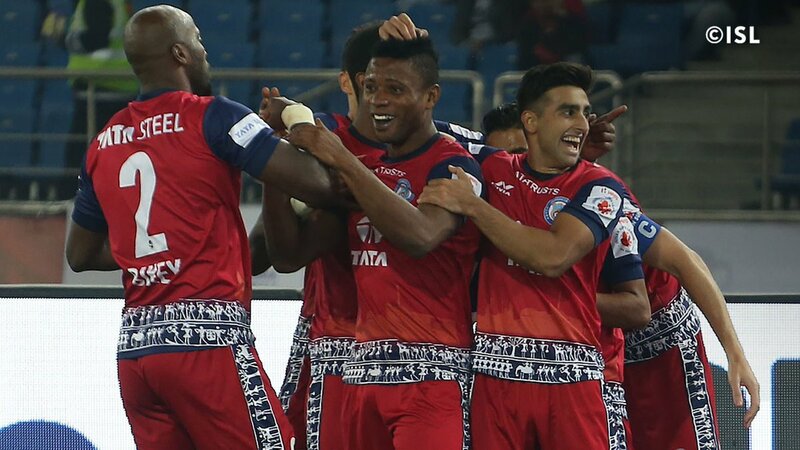 New Delhi, Dec 7: Izu Bobo Azuka scored the lone goal as Jamshedpur FC defeated Delhi Dynamos FC 1-0 in an Indian Super League (ISL) match here on Wednesday. Azuka (60th minute) scored on the hour mark to hand ISL debutants Jamshedpur their first win in the lucrative tournament. Delhi on the hand, suffered their second consecutive defeat at home. Jamshedpur, who kept a clean sheet for the fourth consecutive match, rose to the fifth spot in the 10-team table with six points from four matches. Delhi, who slipped to the ninth position, have three points from four matches. Delhi enjoyed the majority of possession early in the first half but the first big chance came at the other end in the 21st minute. Brazilian midfielder Memo's forward ball for Bikash Jairu set up the attack and the winger found Azuka in the box. The last named, however, saw his attempt sail wide of the post. At one point Miguel Angel Portugal's side had over 71 percent possession but had nothing else to show. Jamshedpur FC were happy to defend deep inside their own half and tried to hit Delhi on the counter whenever possible. Siddharth Singh's darting run into the Delhi box in the 29th minute opened up a shooting opportunity for Matheus Trindade, but the Brazilian's side-footed shot was well blocked by Vinit Rai. Delhi continued to dominate possession in the second half but Jamshedpur FC were showing more ambition going forward. In the 56th minute, Jamshedpur FC were presented a golden opportunity to take the lead from the spot after Pratik Choudary brought down Azuka inside the box. Former Cameroonian international, Andre Bikey stepped up to take the kick but his tame effort was easily stopped by Delhi Dynamos goalkeeper Albino Gomes. Just two minutes later, Steve Coppell's side went ahead thanks to Azuka's header. Mehtab Hossain's free-kick from the left found Azuka unmarked inside the box and the Nigerian forward had a simple task of guiding the ball past the Delhi goalkeeper. Delhi tried to get back into the game but couldn't find a way past Jamshedpur's solid defensive line. Despite having 70% of ball possession the Delhi side failed to really trouble Jamshedpur FC goalkeeper Subrata Paul who now has four clean sheets in a row.